Labels: ebc09 , edubloggercon09 , informal learning , isthatdrapersmokingcrackagain? We have it in our power to begin the world over again. A situation, similar to the present, hath not happened since the days of Noah until now. The birth of a new world is at hand. In reflecting over today's version of EduBloggerCon, I'm struck by how important informal learning is to the educational experience of people - regardless of age, race, and socioeconomic status. Strange that it took an EduBloggerCon to help me see it. Nonetheless, today's didactic experience - for me - was a very good one (and it wasn't because of the "sessions"). Rather, the experiences during which I learned most involved spur-of-the-moment conversations with a number of different people on a wide variety of topics. Today, because of the formal gathering provided by the EduBloggerCon unconference, I was able to engage in meaningful conversations (for which I was extremely grateful) with a number of people, including: Michelle Baldwin, Jon Becker, Liz Davis, Vicki Davis, Kelly Dumont, Scott Floyd, Wesley Fryer, Steve Hargadon, David Jakes, Karen Janowski, Kevin Jarrett, Doug Johnson, Lee Kolbert, Julie Lindsay, Angela Maiers, Scott Merrick, Sylvia Martinez, Scot McCleod, Beth Still, Henry Thiele, Lisa Thumann, Maggie Tsai, Jeff Utecht, Joyce Valenza, Mark Wagner, David Warlick, Paul Wood, and many others. Because of these informal learning “sessions,” I learned a lot. Were they “conversations”? Yes. But there was more to it than that. These were conversations of intense meaning because the people involved effectively served as resources uncommon to the typical day. Clearly these conversations were better than merely “shooting the breeze” because the topics discussed had particular value to those engaged. Furthermore, while similar “conversations” take place on a daily basis online (among people with similar interests but with different cultural backgrounds), because today’s conversations were held in a seemingly traditional face-to-face setting, the emotions and passions felt by conversation participants were easily conveyed. What will it take to provide our students daily with the kind of meaningfully rich learning experiences that typically result from informal learning? Can a formally constructed informal learning environment be recreated with more than sporadic frequency? How might we structure the learning environment in our schools to allow for more informal learning while teaching concepts assessed by federally imposed standardized tests? Why can’t we make informal learning an integral part of the formal learning process? Once we do that, the learning revolution that so many crave will become a reality, essentially marking the birth of a new world of learning for students and teachers alike. 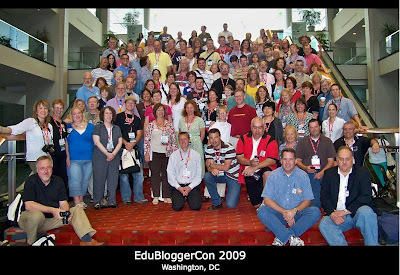 Update: I apologize for seemingly dehumanizing the events of EduBloggerCon in this post. I wouldn't normally do so but I'm really trying to wrap my head around what it is about today's landscape that is essential to the learning processes of our students. Frankly, I see even clearer how little our students need us to feed them with information. They can get that for themselves, thank you. Rather, students need teachers to give them what the Internet can't: love, empathy, and a physical person in the room that genuinely cares for their needs. Original image source: Flickr user WOScholar. Step back and slowly walk away from your social networks - cause it'll be nothin' but NECC for the next five days. Don't worry: Your regularly scheduled networked learning will return to its normal state on July 2. Not that there's anything wrong with Singer sewing machines, or boring our students, or even teaching to the test. It's just that I think our patrons deserve better pedagogy, more support, and now. I sent this in an email to my doctoral committee today. I'm getting excited. 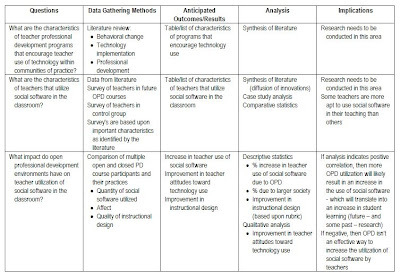 What are the characteristics of teacher professional development programs that encourage teacher use of technology within communities of practice? What are the characteristics of teachers that utilize social software in the classroom? What impact do open professional development environments have on teacher utilization of social software in the classroom? Open Enrollment - All that desire are welcome to participate. Not limited to the course we've named OpenPD. Thus more of a movement - like Open Education - than a particular class. OpenPD – This is a series of PD classes that I taught wherein teachers were invited to participate, regardless of their geographic location. K12 Online – This is a free conference wherein teachers can participate with others, receiving a level of professional development and tailored to individual teacher needs. Connectivism & Connective Knowledge – This online course has also been termed a “Massive Open Online Course,” has been used as a form of professional development by many teachers. What are your thoughts, how well do you think these methods will answer my questions, and what suggestions do you have regarding these efforts? What do you think? Have I got a leg to stand on? When a new school district is built, then entire departments must be created anew. When entire departments are created anew, then entire teams must be hired. Once entire teams are hired, then entire teams need to go through some sort of introductory "training" to ensure that everybody on those teams is on the same page, working toward the same end (and I'm not just talking retirement here). So... after hiring an entire ed-tech team (we're almost there) to join an entire newly hired IT department because we've been building this new school district... we'll be conducting our introductory ed-tech "training" in a just few weeks (the week of July 13, actually). In preparation for such a task, I've invited folks to share. My gut feeling is that many of us are still at the "net add" stage. Translation: Many of us are at the "offline subtract" stage, as well. In this week's Tech Learning post, I decided to follow Dean Shareski's lead and include my first attempt at mashing an inspirational quote with a selection of stock photography since Dan Meyer offered his constructive push-back against the practice in April. For the most part, I find myself agreeing with Dan's arguments and have had to seriously reflect on the message I've tried to send and the manner in which I should send it. How might I now better tell the story? Personally, I think that the quote is the story. However, combining the correct image with the quote brings added depth to the story and how it might be perceived. 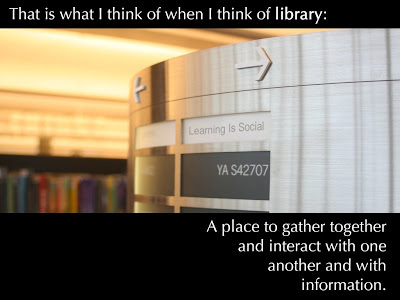 To illustrate, in this example the picture serves to bridge the gap between what many might perceive as a traditional media center (with books, call numbers, and signs pointing the way) and the kind of library portrayed in the text (a sort of social gathering place). Furthermore, the small sign in the picture - edited by me - additionally and almost subconsciously promotes a message that I would include in the text: that learning is social. Quotation: Carolyn Foote, punctuation altered.